It all started when we were in the car on the way back from the vet. Taji was slightly overweight, so Cleodhna was calling him “fat boy”, “lardass”, and so on. He’d put up quite a struggle before they could take a blood sample, so she was also alternately calling him “petunia”, “wussbag” etc. Then she crossed the streams. That was instantly, indelibly, unavoidably, his nickname from then on. He gained more nicknames over the years: “chocolate” from when he ate an entire bar of Green & Black’s and had to be rushed to the emergency vet (the case notes for that incident read in part “large amount of dark brown chocolate smelling vomit produced”); “bell” from the bell we put on his collar when in France so we could hear him having got out of our garden and into the neighbours’. He would blow his coat twice a year, but refused to let us brush him, or pluck any more than a few handfuls of tufts off him; that was where “fruity hairball” (or, possibly, “hairy fruitball”) came from. (When he needed to have his teeth descaled, something that by necessity involves general anaesthesia because you can’t tell a dog to hold his head still and not move, we asked the vets to also pluck all the loose hair from him while they were at it. One of the vet nurses described the process as “oddly therapeutic”, like doggy bubble wrap.) He got “deckchair” from his habit of lying down from standing: first cantilevering his hindquarters down, then his front. He was also the first of our dogs who truly had a voice of his own. Something about him made us want to speak aloud the thoughts that, we were quite clear, were going through that strange doggy brain of his. Typically they would start with “you have food. Give it to me”; when rebuffed, he would point out good and noble things that he had done recently, and, after a pause, “I should be rewarded”. (If we pointed out that he’d just had such a thing only moments ago, his response would be “I have no concept of time”.) He seemed the sort of dog that would try to argue logically but fail, so we delighted in him spouting grotesquely flawed arguments. His first owner thought he was (or should be) a tough guy dog, and taught him all sorts of bad habits; two other would-be owners returned him to the kennels because he was too boisterous. Cleodhna had bruises all over her arms and legs when we first got him because he would occasionally do a “batzoid” when out on walks, jumping up and biting her. Eventually we realised that this wasn’t aggression, but something he thought was a game that he should play, so we resolved to just turn our backs until he stopped, and within a couple of months he stopped and never did it again. In truth, Taji was a total goofball - “cozy lummox” I’d call him. He loved nothing more than to sleep on the bed with me; I’d have to make sure that the duvet was spread over his side of the bed because he wouldn’t lie down otherwise, he’d turn around in place two or three times just to be sure, and then flop down beside me with a satisfied sigh. Often work started later than planned because how could you get out of bed when there was a warm furry akita to cuddle? 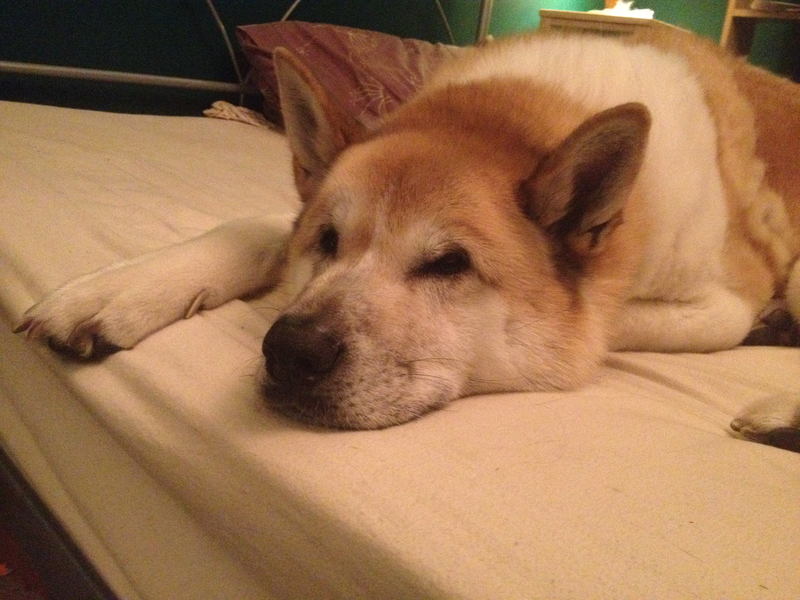 When Berkeley died we decided we would truly embrace the life of endless drifts of dog hair and get a longcoat Akita. Ella is as different from him as it’s possible to be while still being the same breed, but he patiently accepted her into the family, even when she decided that the best thing about his tail was that it would fit in her mouth. He was slowing down - 10 is a reasonable age for a large dog like an Akita - but the arrival of a new puppy rejuvenated him to some degree; only a couple of weeks ago they were happily romping in the garden. In the end, it was quick: he suffered a quick gastric dilation that damaged a fairly hefty part of his stomach lining, which then proceeded to leak toxins into his system. We rushed him to the vet on Thursday evening, then again on Friday afternoon, and he was dead on Saturday morning. Ella is arguably a “better” dog - she has a wonderful temperament, without any hang-ups, and she’ll let us brush her. I look forward to when she’s fully grown and I have to stop calling her puppy and can instead call her Your Furry Highness or Your Hairy Majesty. 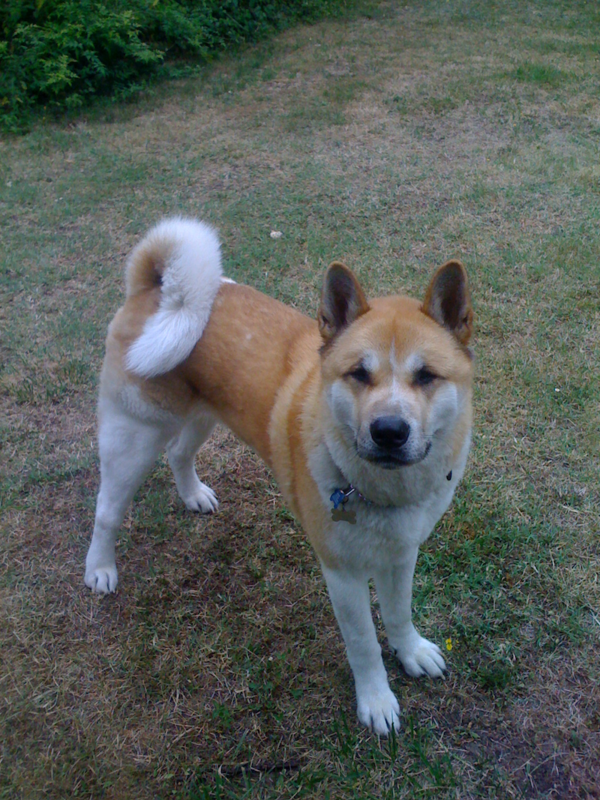 But we would never have had her if Taji hadn’t first shown us the Way of the Akita. Thank you for all you gave us, dear old boy. I miss you terribly. This page contains a single entry by Sam Kington published on July 16, 2016 1:48 PM. Once is happenstance; twice is coincidence; what would third be? was the previous entry in this blog. No dog show for us this year is the next entry in this blog.